164 pages | 8 B/W Illus. "I can think of no more timely, moral, and smart approach to literacy in and out of school than Jennifer Clifton’s new book. Unless we humans learn to discuss critical issues with each other across differences in a joint journey, not to conversion, but to a better shared world, there may soon be no livable world left for us." "The ideas in this book completely transformed my perspective as an argument writing teacher. My students now view conflict as more than a two-sided philosophical battle of little interest or relevance. Rather than ‘solving’ hypothetical problems by choosing the 'right' stance, they engage with community stakeholders to enact real change. Their flexibility in critically weighing complex issues results in their being better equipped to grapple with the complexities of the adult world." 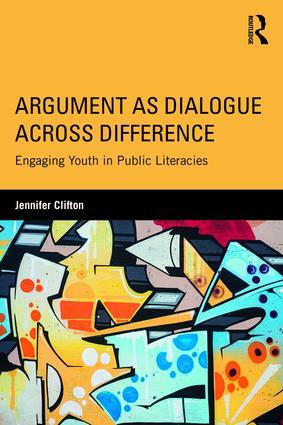 "Jennifer Clifton’s ideas should provoke teachers of argumentation—that is, all English, debate, and composition teachers—to rethink the nature of argument as well as their purposes and practices for teaching it. In thoughtful, but accessible prose that invites readers into dialogue, Clifton unpacks a theoretical and practice based stance that veers from the polarization so evident in contemporary society and instead offers innovative ways to engage wide-ranging perspectives within ever changing and diverse contexts." "Clifton offers a theoretically rich and beautifully felt account of why we must teach argument as a means of positive social change in secondary through university classrooms. As Clifton notes, the stakes could not be higher, from police brutality and wage disparities, to marriage rights and access to clean water; how youth learn to argue together is fundamentally about crafting more equitable futures. Necessary reading for all of us who teach and study literacies, composition, and justice." Jennifer Clifton is Assistant Professor, Department of English (Rhetoric and Writing Studies), The University of Texas at El Paso, USA.